More information about each recording is available by clicking on the title of the recording. All recordings are available through History San Jose’s Internet Archive page. Douglas M. Perham (1887-1967) was an early wireless experimenter and broadcaster, and a talented technician. His career spanned the first fifty years of commercial electronics in the West — from his first youthful experiment with a Marconi coherer in 1898 to his retirement from Varian Associates in 1953. In 1909, Doug was the first American employee of Palo Alto’s first successful electronics manufacturing company, Poulsen Wireless — Federal Telegraph Company. There he built the company’s first four Poulsen arcs, and later served as “installation engineer,” setting up Federal stations in Stockton, San Francisco, Los Angeles, and El Paso. Doug’s own house in Palo Alto served as Federal’s first laboratory. Here he worked with Lee de Forest’s research team (1911-12) on two devices that made large scale radio transmission possible, the Audion amplifier and the vacuum tube oscillator, as well as with Peter Jensen on early versions of a loudspeaker, the beginnings of Magnavox. 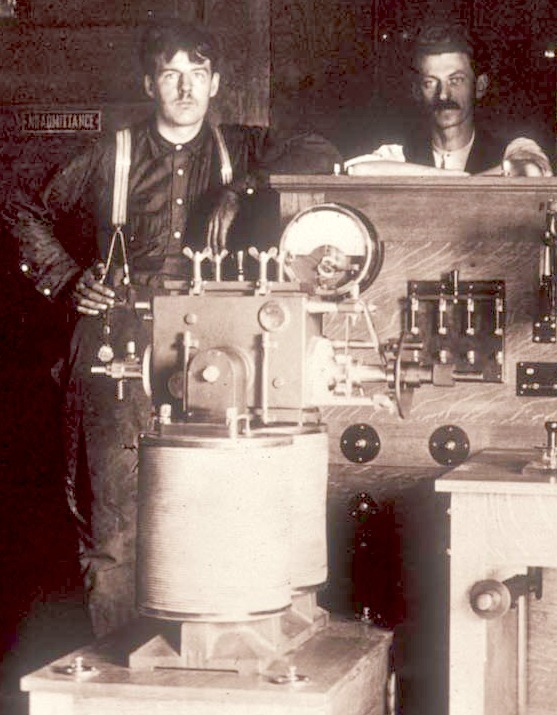 Twenty-five year old Perham with fellow technician C. Albertus at Poulsen Wireless (later Federal Telegraph). 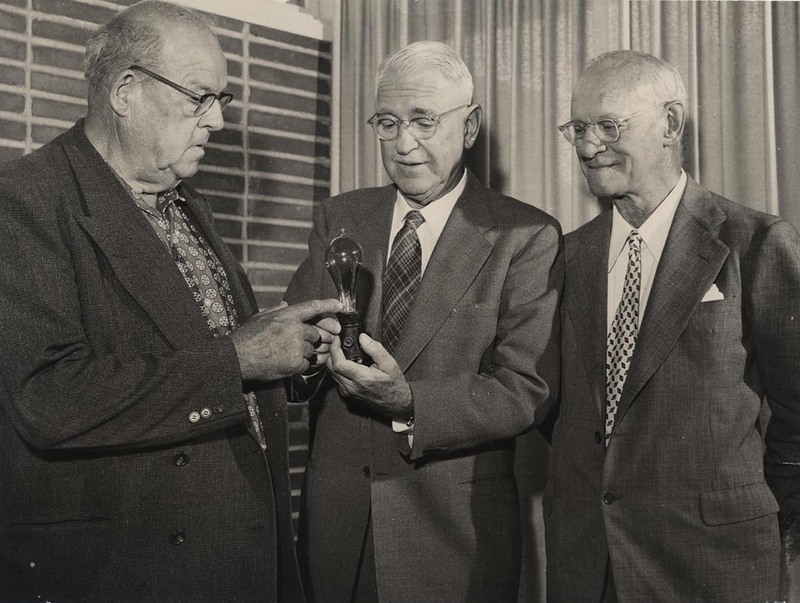 During the 1920s, Perham became one of Iowa’s first radio broadcasters. In 1922, he built and began operating radio station WJAM, one of the first licensed broadcasting stations in Iowa. 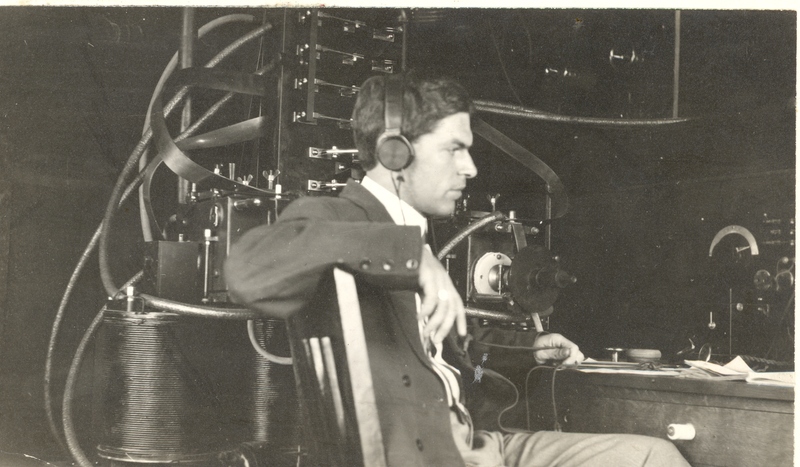 Life as a radio broadcaster lost its appeal in 1928, and the native Californian rejoined Federal Telegraph Company in Palo Alto, where his friend Leonard Fuller had recently returned as Chief Engineer. When the Depression, and Federal’s merger with Mackay Radio, prompted layoffs, Perham worked on short wave wireless experiments and other development work with Heintz and Kaufmann in South San Francisco while he developed a subcontracting business in Redwood City (1933-1946) and later San Carlos (1946-1953). His shop specialized in machine work for local electronics firms. He built dies and parts for various electronics firms, including Dalmo-Victor, where he also served as a consultant on radar parts. Doug’s workshop also produced parts for Ampex products during and after the war. 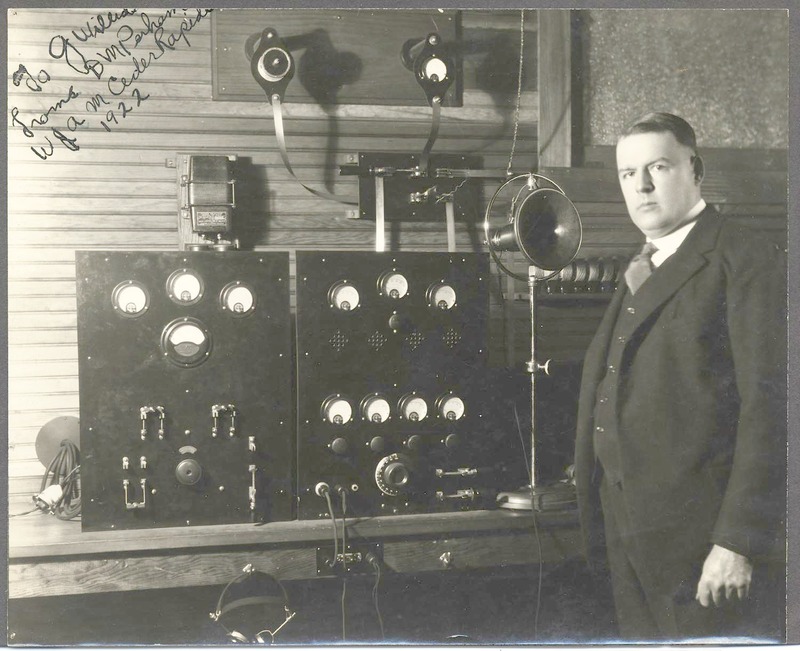 Douglas Perham in 1922 at his Cedar Rapids station, WJAM. Perham’s company made parts for early experimental klystrons for Russell and Sigurd Varian’s first Sperry Gyroscope contract. After the war, Perham joined the newly established Varian Associates in 1948 as staff member and “expeditor” until his retirement in 1953. He was also their landlord — in 1946, Varian leased Perham’s machine shop next door to their facility on Washington Street in San Carlos, until their move to Stanford University’s industrial park in 1954. In March 1953, Doug, a lifelong collector, joined forces with Connie Kambish, an avid collector in her own right and creator and curator of the New Almaden Quicksilver Mining Museum. Doug presented his “Cavalcade of Electronics” at New Almaden throughout the 1950s and 1960s. (They were married in 1958). The collection could not help but parallel his career. It was meant to display the evolution of electronics, taking viewers by way of Federal Telegraph, Lee de Forest, Heinz & Kaufman, and Varian. He proudly displayed the burned out light bulb given to him, at age six, by George Westinghouse. According to Perham, Westinghouse advised him: “Young man, get your hands on some of these things and save them. They will have a valuable historical significance some day.” Doug cherished the advice, and collected and kept pieces of gear after they had outlived their usefulness. Douglas Perham, Leonard Fuller and Cyril Elwell view one of the first lamps to be installed aboard a steamship, at WESTCON, San Francisco, 1957. In 1959, heavy rains and flooding destroyed valuable pieces of the collection and badly damaged part of the adobe museum building. That year, the Perham Foundation was formed with the help of the IRE History Committee and friends throughout the electronics community to find a more suitable home for the collection. In 1964, with Doug in failing health, Foothill Community College, in Los Altos, was selected. Sadly, less than a year before ground was broken for the Foothills Electronics Museum, Doug Perham, aged 82, died August 14, 1967 in San Jose. In 2003, the Perham Collection was donated to History San Jose.